Before constructing, in 1935, a V-twin that he planned to be the fastest bike in the world, engineer Albert G. "AI" Crocker became fascinated by European-style speedway racing, a discipline that had burst onto the US scene. Crocker, who in 1928 had headed west from Kansas City to establish a major Indian dealership in Los Angeles, and also manufactured spare parts for the Springfield Wigwam, had everything he needed on hand. 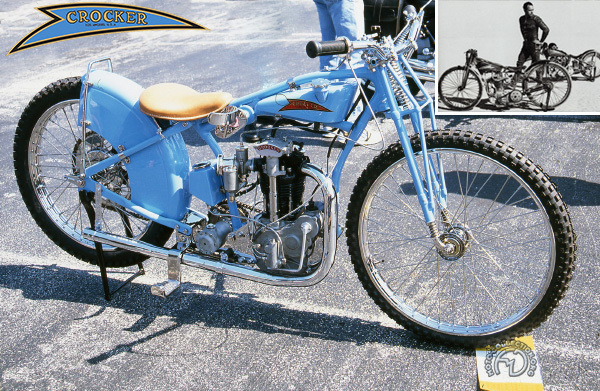 In 1931, Crocker began building a speedway bike. The tracks were flourishing around LA that summer, so testing was easy. He designed a frame and tested it out with a V-twin borrowed from an Indian Scout 101. Then, in 1932, he began racing ohv SOOs based on highly-modified Scouts. These Crockers won many races – in the summer, they ran in Los Angeles, San Diego and Santa Ana, and in the winter, they raced in Mexico City. Crocker took a major step forward in 1933 with a side-valve single of his own design, of which the most famous riders were Cordy and Jack Milne, who later became champion riders in Europe. Developing 40 hp, the Crocker was on a par with the Rudge and more powerful than the Harley type CAC, but the arrival of the 42 hp JAP placed it at a disadvantage. So for 1934, Crocker designed a new engine, an ohv unit with a hemi-head and triple valve springs. It was potentially a top-level contender, but Crocker halted its development in 1934 to concentrate on his V-twin. A rare vintage – only 40 of these fine Crocker Speedway 500s, with their strong chrome molybdenum frames, were built.